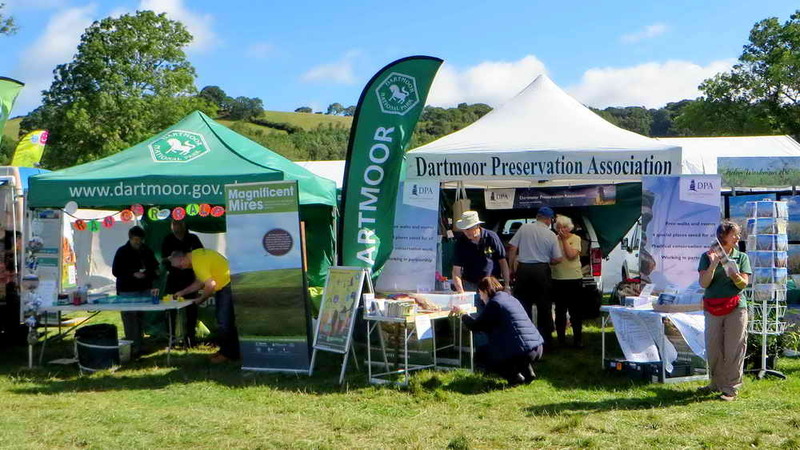 With the season for summer shows progressing, Thursday 17th August was the day of the 117th Chagford Agricultural and Horticultural Show. 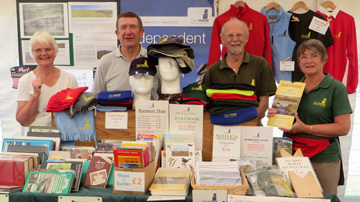 The DPA have attended this show for many years. The gazebo was set up early in the morning with Derek, Val, Phil, Claude and Anne doing the work. Clare, Berni and myself turned up ready for “the off”. 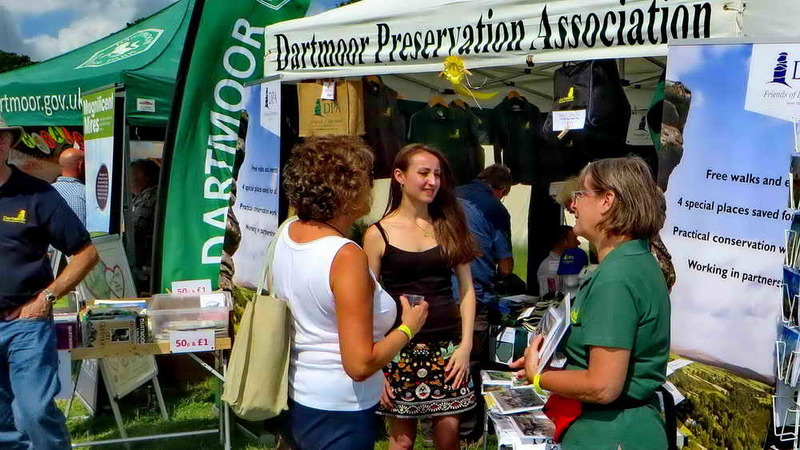 As with other occasions, we were right next to the Dartmoor National Park stand where we see familiar faces. Our other neighbour was an artistic stand selling greetings cards depicting wild flowers, it was almost like a hay meadow next door. 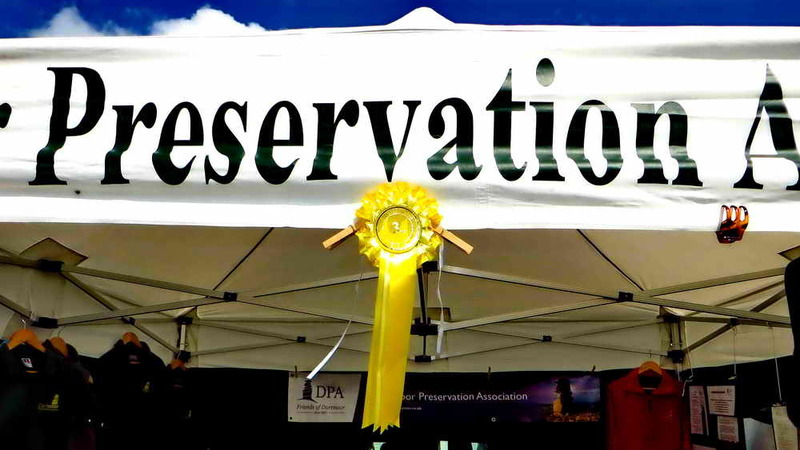 The day went very well, with the award of another rosette (see below). The photo above shows keen, early visitors while Anne and Berni are still setting yp one of the outside side tables. 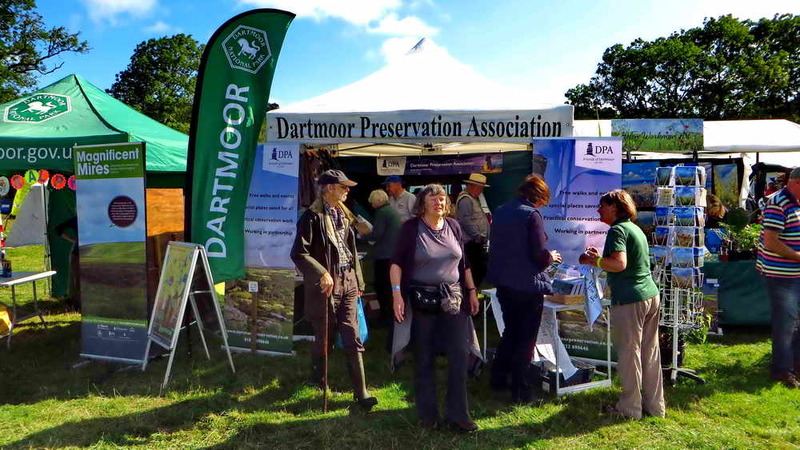 It looks like Berni has one of the famous DPA tea towels that shows the names of a number of tors – where the size of the lettering denotes the relative height of the tor …..
As the caption says ….. still setting up, with Anne putting finishing touches to the book and map stand. Berni is already looking out for potential customers for our excellent calendar, as well as the cards! 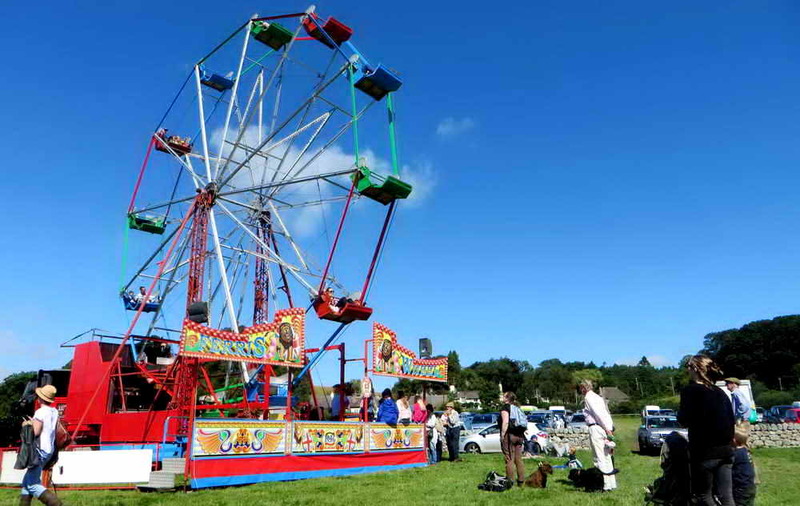 The photo of the big wheel shows the colour of the sky this morning, really blue, although clouds came and went during the day – with a shower as we were leaving the show ground at the end of the day. 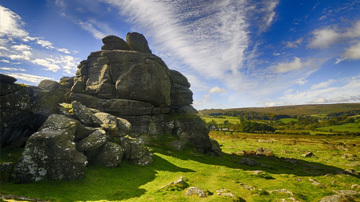 We were lucky with the weather, a few spots of rain but dry for the mostpart. 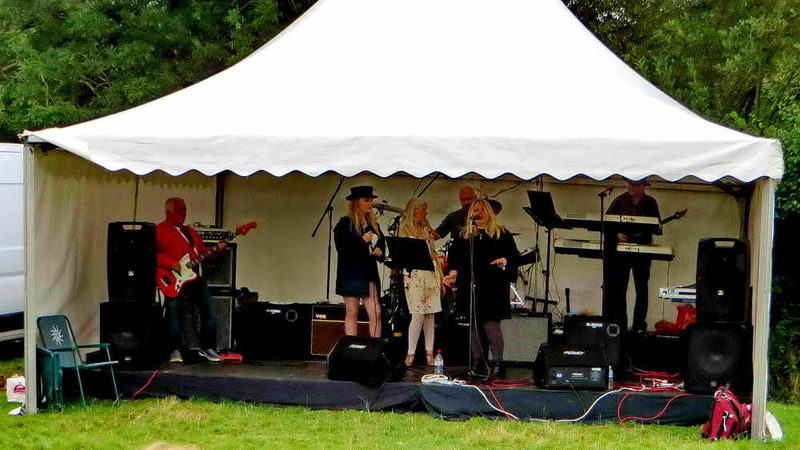 There is always a “slack” period after the show opens, as witnessed by lack of any queue in the beer tent. It is a very different story later in the day. 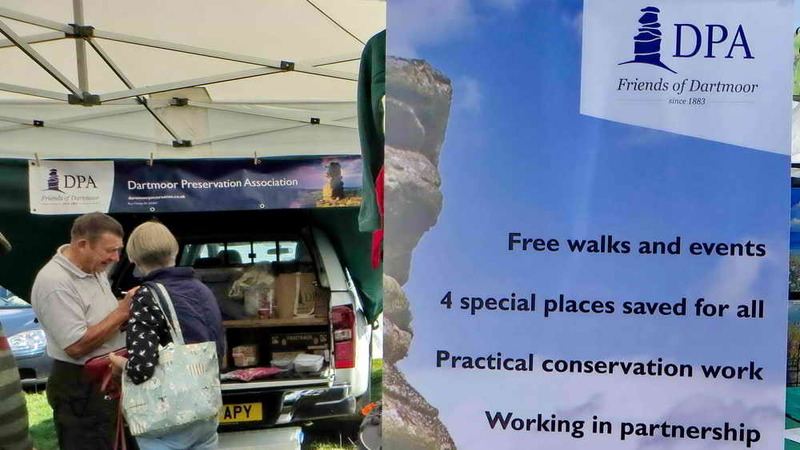 The large sign advertising the DPA’s free walks etc. 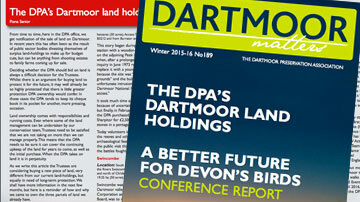 is just part of the eye-catching campaign to publicise what the DPA stands for and what we actually do – all discussion points to attract the attention of passers-by. Some people come and engage with us, asking for more details. 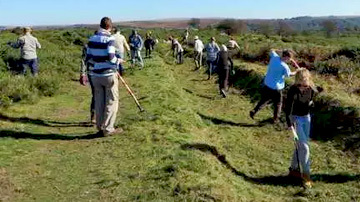 Four new memberships were taken out during the day. Derek, Val, Clare, Claude and Berni with our rosette! 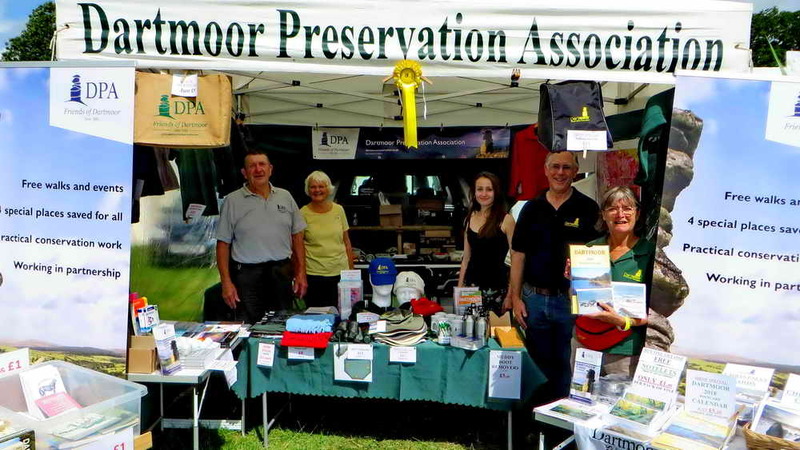 It looks as if Phil and Anne were off on their “breaks” when I took the photograph above – it is always good to be awarded a rosette at any of the shows we attend – these are usually South Zeal Dartmoor Folk Festival, Chagford, Lustleigh and Widecombe Fair ….. 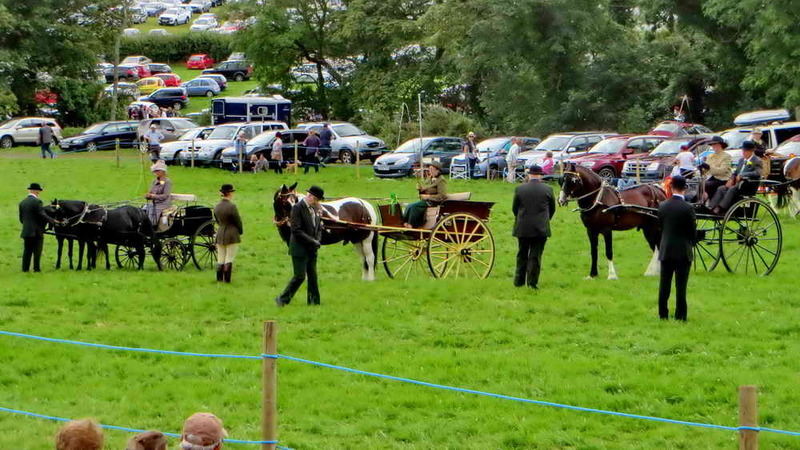 The gold rosette looks really impressive ….. but it actually says”3rd” on it, however, it is a very high-quality bronze! Clare and Berni working hard at Christmas card sales – or was something else being discussed? There is usually a sound stage at these shows and a variety of music styles can be heard. This is at the bottom of the field, next to the beer tent, and the chairs set out are not often empty. Some folks really enjoy their day out! 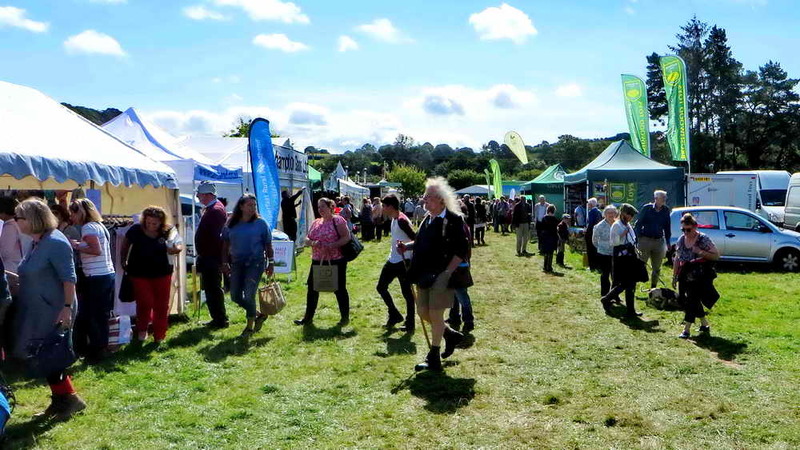 The photograph above shows the “Horticulture” marquee where the flower and vegetable show is held, always worth a look to see what is possible if you try. 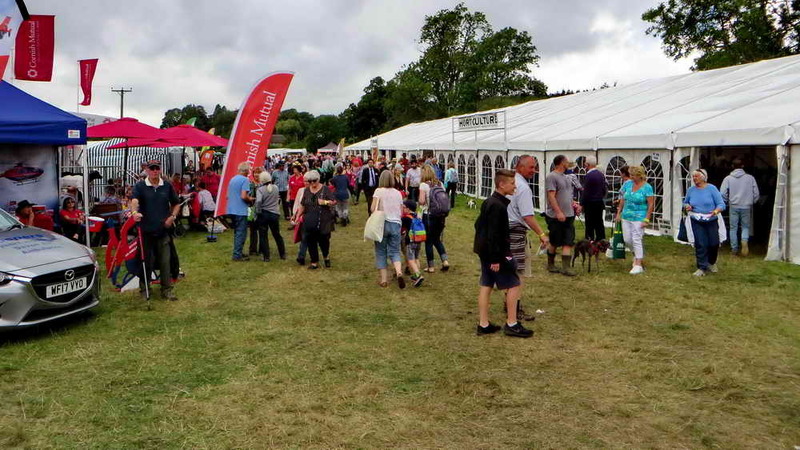 The main show arena is in the field adjacent to where our sort of stands are located, the events taking place throughout the day in the Show Schedule are very impressive. 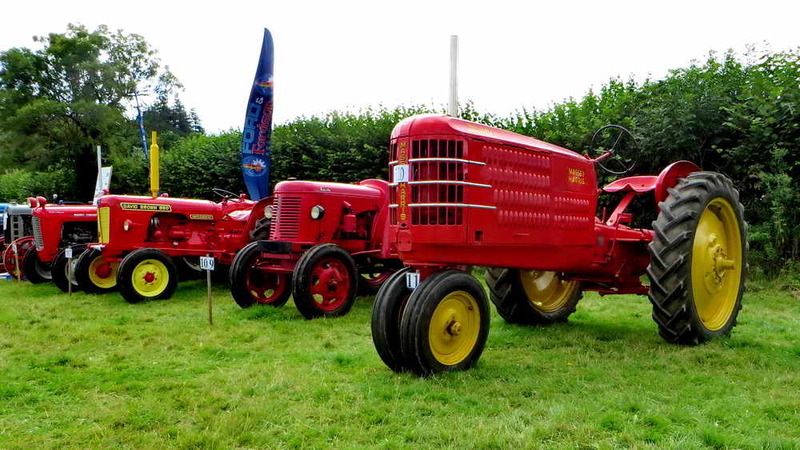 Once again, my weakness, the old tractors – not that I know much about them but they take me back to my childhood in the late 1940s and early 1950s. My father had a small Farmer’s Boy and a Howard Gem rotavator, both walk-behind tractors and also a Ransomes Crawler tractor with caterpillar tracks – that was something very different and a joy to use! I have just done an internet search for the Farmer’s Boy and the first result is a leaflet held by the Museum of English Rural Life, referred to in the National Archives! In a museum! 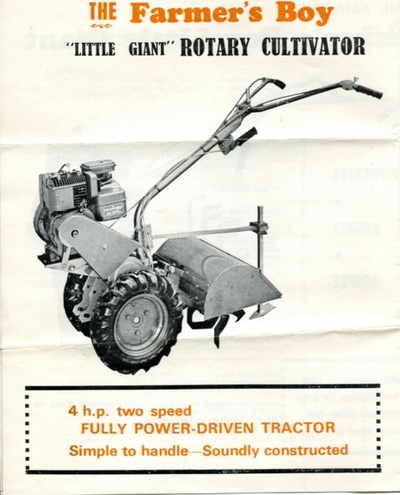 Here is a scan of my own leaflet …..
After that shock, here is a link to the Howard rotavator on Youtube, and also to the Ransomes Crawler – manufactured by MG! 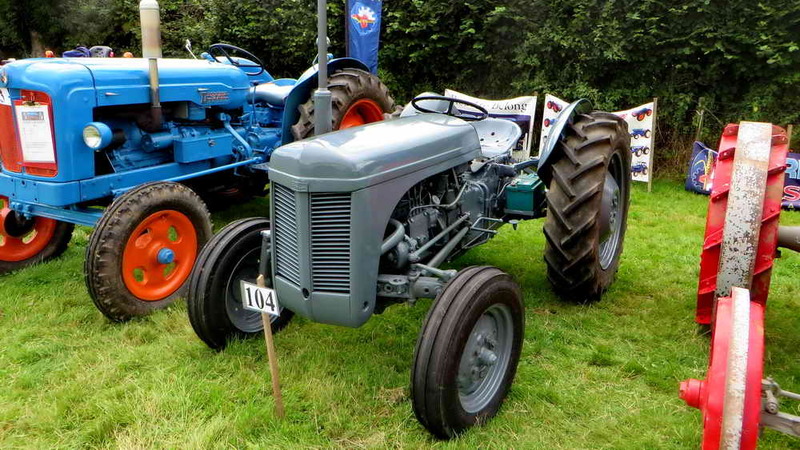 I was going to tell you something about my driving one of these Massey Fergusons around the fields in the big freeze of 1962/1963 while my uncle was on the back forking out hay for his cows, but I think I’ll leave it here while I recover. In a museum, indeed …..